And lay hold of me it did! With such joyful results that the idea of making it available to others intrigued me no end. Seeing that joy in others who hold the book and take it into their hearts and lives – that’s what keeps me here. 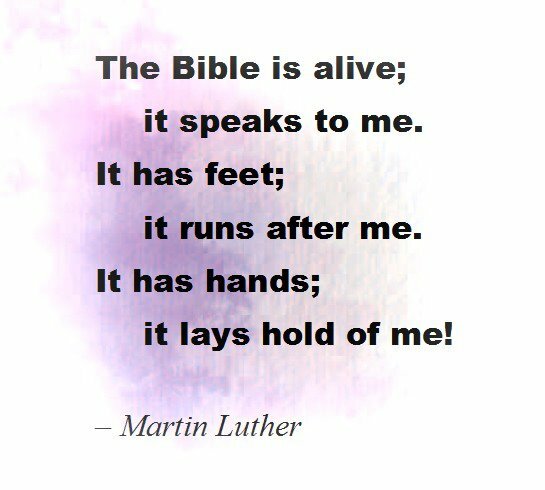 I thought that you might also like this image drawn by Josh Harris after his pastor preached on Jude and quoted these same words from Martin Luther. Although, I would draw it with both running toward each other. People sometimes ask me if we use the English alphabet to write other languages. The answer is not a simple yes or no. Take this example, which is John 3:16 in Nkonya, a language of Ghana. Tsúfɛ́ dwɛ́ Bulu lɛ́hɩɛ dwɛ́ anyánkpʋ́sa. Mʋ́ sʋ ɔlɔpʋ mʋ Bi ɔkʋkʋ́nʋ́ ɔkʋlɛ pɛ́ ámʋ há, mɛ́nɩ ɔhagyíɔha ánɩ́ ɔlɔhɔ mʋ gyi omóowu, mboún obénya nkpa ánɩ́ ɩtamatá. A lot of the letters are the same as in English including all of the consonants. But some new vowels have been added: ʋ and ɔ for example. In addition, there are accents above the characters like those in French. So Nkonya uses the same characters as English, but with a few additions. Also, some language do not use some letters, notably q. Two things have a big influence on what letters are used in the alphabet of a language. Every language is unique, so we use the tools of descriptive linguistics to discover what sounds are in the language. That way the alphabet reflects the language, rather than imposing an alphabet that would be foreign. Plus, doing that makes it a lot easier for people to read and write the language. The second big influence is tradition. English is the official language of Ghana, so it is natural that the way Nkonya is written corresponds to English as much as possible without changing what is uniquely Nknoya about the language. But, other places have different traditions. The speakers of a minority language in Thailand, for example, would probably want their language written in a way similar to Thai which looks like this. But sometimes people have a way to write their language that is different from the dominant language. 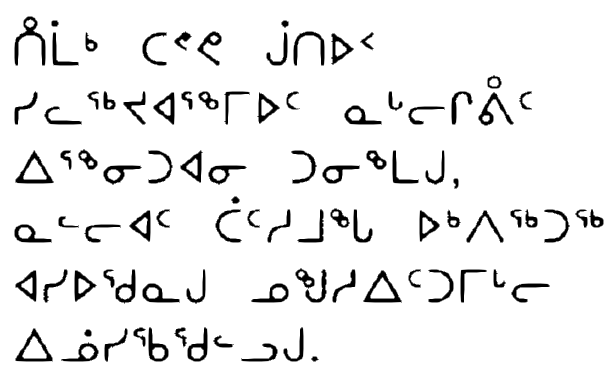 This is the case for the Inuit language of Canada in which the Bible was just published for the first time. It does not use an alphabet, but rather a syllabary which looks nothing like English or French. Remember that these strange-looking letters look completely normal to the people who read them every day and English looks just as strange to them as these do to us. If you are ever in North Carolina, consider making your way to the museum of the alphabet outside Charlotte which traces the history and diversity of ways we human beings write our languages.